My Wandering Life: Happy Blogaversary! Wow, the last twelve months have flown by! My goal was to update the blog every day, and I came quite close with 338 posts over the last 365 days. A year ago Michael was on a business trip in Macau and I was thinking of ways to make our old family website more of a blog to update everyone on our adventures when we moved overseas, yet again. That day I'd taken the boys up to Rocket Ship Park, which overlooks the entire Los Angeles Basin and the shoreline from Palos Verdes to Malibu. 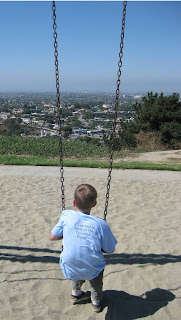 Both boys were missing their Daddy, and I found Nathan sitting on the swings, looking at the amazing view. I couldn't resist snapping a photo before I took the swing next to him and asked what he was thinking about. He said there were so many places in the world that he hadn't seen yet, and he marveled over how big it was! I said that what he was looking at was only the Los Angeles Basin, that the world was actually quite a bit larger. Then he asked if we were going to see it all. I asked him if he'd like to see it. He said yes, and I said that we would do our best. It was just this really sweet moment, and I felt so grateful that we have this lifestyle of crazy international moves. It just really made all the chaos seem worth it. Of course, we now know that the whole Macau thing fell apart and even more changes are in the pipeline, but at the time I was bursting with pride and joy that we were raising kids who loved the world as much as their bedrooms, willing to explore whatever was on the horizon. Later that day I saw the Mark Twain quote about boys that is featured at the top of the blog. Between the photo and the quote, I felt inspired to create a whole new blog that featured the boys, and the "wonder" that they experience every day. Mainly it was for the Grandparents, Aunties, and my friends who are fond of the boys but do things like head to Northampton for the summer and can't be with them. Now a year later, Boy Wonder has had over 7,400 visits from people all over the world. If you click the map icon on the left column, you can see the little red dots representing visitors from places like Poland, Lebanon, and Luxembourg. We even picked up a handful of followers I've never met (like Argon One, whose own kids are grown and moved out but stops by Boy Wonder when he needs a touch of nostalgia). Needless to say, I'm shocked that the daily life of the two people at the center of my world would be so interesting to so many people! So I just have to say thank you. Thank you for coming back every day, or subscribing, or passing this along to your friends. It's been fun. And knowing that someone out there somewhere is actually reading this inspires me to keep recording these little moments of discovery, growth, success and failure. Nathan has taken a keen interest in it, and he's generally the one who chooses the colors and new photos under the headline. Before you know it, he'll be the one updating! I'm glad I started the blog when I did as it will always be easy for me to remember that July 17th is also Disneyland's Birthday. Yes, I realize that for the general population this isn't a date that stands out, but when you've spent many, many years getting a paycheck signed by Mickey Mouse, it's memorable! So happy 54th Birthday to Disneyland, and happy 1st Birthday to Boy Wonder! Many happy returns to both! Who goes to New Hampshire?